↑ 1.0 1.1 1.2 1.3 Muzio, Bruno Di. "Frontal pole | Radiology Reference Article | Radiopaedia.org". radiopaedia.org. ↑ 2.0 2.1 Frontal Lobe. healthline. ↑ Carpenter, Malcolm (1985). Core text of neuroanatomy (3rd ed.). Williams & Wilkins. pp. 22–23. ↑ Stuss, D. T., & Knight, R. T. (Eds.). (2002). Principles of frontal lobe function. Oxford University Press. ↑ Sánchez-González, M. Á., García-Cabezas, M. Á., Rico, B., & Cavada, C. (2005). The primate thalamus is a key target for brain dopamine. Journal of Neuroscience, 25(26), 6076-6083. ↑ Gene Slows Frontal Lobes, Boosts Schizophrenia Risk. ↑ Kimberg DY, Farah MJ (December 1993). "A unified account of cognitive impairments following frontal lobe damage: the role of working memory in complex, organized behavior". Journal of Experimental Psychology. General. 122 (4): 411–28. ↑ Rolls, E. T., Hornak, J., Wade, D., & McGrath, J. (1994). Emotion-related learning in patients with social and emotional changes associated with frontal lobe damage. Journal of Neurology, Neurosurgery & Psychiatry, 57(12), 1518-1524. ↑ Niedermeyer, E. (2001). Frontal lobe disinhibition, Rett syndrome and attention deficit hyperactivity disorder. Clinical Electroencephalography, 32(1), 20-23. ↑ 10.0 10.1 Chelune, G. J., Ferguson, W., Koon, R., & Dickey, T. O. (1986). Frontal lobe disinhibition in attention deficit disorder. Child Psychiatry and Human Development, 16(4), 221-234. ↑ Porrino, L. J., Crane, A. M., & Goldman‐Rakic, P. S. (1981). Direct and indirect pathways from the amygdala to the frontal lobe in rhesus monkeys. Journal of Comparative Neurology, 198(1), 121-136. ↑ 12.0 12.1 Stuss DT, Gow CA, Hetherington CR (June 1992). "'No longer Gage': frontal lobe dysfunction and emotional changes". Journal of Consulting and Clinical Psychology. 60 (3): 349–59. ↑ Rowe AD, Bullock PR, Polkey CE, Morris RG (March 2001). "'Theory of mind' impairments and their relationship to executive functioning following frontal lobe excisions". Brain. 124 (Pt 3): 600–16. ↑ Phineas Gage's Brain Injury. Verywellmind. 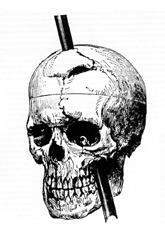 ↑ Phineas Gage: Neuroscience’s Most Famous Patient. Smithsonianmag. ↑ Robinson RG, Kubos KL, Starr LB, Rao K, Price TR (March 1984). "Mood disorders in stroke patients. Importance of location of lesion". Brain. 107 (1): 81–93. ↑ Durani, Shiban K.; Ford, Rodney; Sajjad, S. H. (September 1991). "Capgras syndrome associated with a frontal lobe tumour". Irish Journal of Psychological Medicine. 8 (2): 135–6. ↑ Lu T, Pan Y, Kao SY, Li C, Kohane I, Chan J, Yankner BA (June 2004). "Gene regulation and DNA damage in the ageing human brain". Nature. 429 (6994): 883–91. ↑ Zhang Y, Wang M, Li H, Zhang H, Shi Y, Wei F, Liu D, Liu K, Chen D (June 2012). "Accumulation of nuclear and mitochondrial DNA damage in the frontal cortex cells of patients with HIV-associated neurocognitive disorders". Brain Res. 1458: 1–11. ↑ Giedd JN, Blumenthal J, Jeffries NO, et al. (October 1999). "Brain development during childhood and adolescence: a longitudinal MRI study". Nature Neuroscience. 2 (10): 861–3. ↑ Fjell AM, Walhovd KB, Fennema-Notestine C, et al. (December 2009). "One-year brain atrophy evident in healthy aging". The Journal of Neuroscience. 29 (48): 15223–31. ↑ Coffey CE, Wilkinson WE, Parashos IA, et al. (March 1992). "Quantitative cerebral anatomy of the aging human brain: a cross-sectional study using magnetic resonance imaging". Neurology. 42 (3 Pt 1): 527–36. ↑ Ogren K, Sandlund M (2007). "Lobotomy at a state mental hospital in Sweden. A survey of patients operated on during the period 1947-1958". Nordic Journal of Psychiatry. 61 (5): 355–62. ↑ Semendeferi, K; Lu, A; Schenker, N; Damasio, H (March 2002). "Humans and great apes share a large frontal cortex". Nature Neuroscience. 5 (3): 272–6. ↑ Friederici, AD (April 2009). "Pathways to language: fiber tracts in the human brain". Trends in Cognitive Sciences. 13 (4): 175–81.